January 16: Due date for the fourth installment of 2017 individual estimated tax. January 31: Due date for employers to furnish W-2 statements to employees, and to file Forms W-2 with the Social Security Administration (both paper and electronic forms). •	Reduces income tax brackets. The bill retains seven brackets, but at reduced rates, with the highest tax bracket dropping to 37 percent from 39.6 percent. •	Double standard deductions. The standard deduction nearly doubles to $12,000 for single filers and $24,000 for married filing jointly. To help cover the cost, personal exemptions and most additional standard deductions are suspended. •	Caps state and local tax deductions. State and local tax deductions are limited to $10,000 total for all property, income and sales taxes. •	Caps mortgage interest deductions. For new acquisition indebtedness, mortgage interest will be deductible on indebtedness of no more than $750,000. Existing mortgages are unaffected by the new cap as the new limits go into place for acquisition indebtedness after Dec. 14, 2017. The act also suspends the deductibility of interest on home equity debt. •	Limit on theft and casualty losses. Now only available for federally declared disaster areas. •	No more 2 percent miscellaneous deductions. Most miscellaneous deductions subject to the 2 percent of adjusted gross income threshold are now gone. •	Cuts some above-the-line deductions. Moving expense deductions get eliminated except for active-duty military personnel, along with alimony deductions beginning in 2019. Weakens the alternative minimum tax (AMT). The bill retains the alternative minimum tax but changes the exemption to $109,400 for joint filers and the phaseout threshold to $1 million. The changes mean the AMT will affect far fewer people than before. •	Bumps up child tax credit, adds family tax credit. The child tax credit increases to $2,000 from $1,000, with $1,400 of it being refundable even if no tax is owed. The phaseout threshold increases sharply to $400,000 from $110,000 for joint filers, making it available to more taxpayers. Also, dependents ineligible for the child tax credit can qualify for a new $500-per-person family tax credit. •	Expands use of 529 education savings plans. Qualified distributions from 529 education savings plans, which are not subject to tax, now include tuition payments for students in K-12 private schools. •	Doubles estate tax exemption. Estate taxes will apply to fewer people, with the exemption doubled to $11.2 million ($22.4 million for a married couple). •	Reduces pass-through business taxes. Most owners of pass-through entities such as S corporations, partnerships and sole proprietorships will see their income tax lowered with a new 20 percent income reduction calculation. Have your documentation in order. Keep your records in order by being meticulous about your record keeping. Items that will support the tax breaks you take include: cancelled checks, receipts, credit card and investment statements, logs for mileage and business meals, and proof of charitable donations. With proper documentation, a correspondence letter from the IRS inquiring about a particular deduction can be quickly resolved before it turns into a full-blown audit. 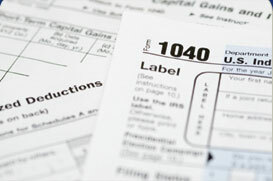 Remember, the average person has a less than 1 percent chance of being audited. If you prepare now, you can narrow your audit chances even further and rest easy after you've filed. If you are divorced and have young children, there's a good chance that you are paying or receiving alimony or child support (or both) under a divorce decree. What's the difference? The distinction is important to the IRS. Currently, alimony is deductible by the party who pays it and taxable to the party who receives it. Child support is neither deductible nor taxable. Keep these rules in mind when your 2017 tax return is filed. We can help you determine tax issues related to your alimony payments. Contact us.